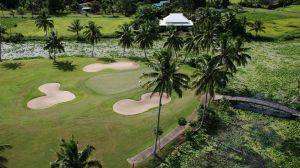 We offer a choice of over 1 golfcourses spread out thru Fiji. Book green fees and tee times in REAL TIME and get your confirmations immediately. The Pearl Championship Golf Course & Country Club is set amongst tropical rainforests and winding canals, with 66 bunkers and multiple water hazards on 12 of the 18 holes. Designed by Robert Trent Jones Junior this course is one of the most adventurous in the world.